There has recently been another round of discussion about associative and dissociative mechanics. Here is Justin Alexander’s restatement of his original thesis, a post by Zak about diegetic and extradiegetic thinking, Carter Soles on healing surges, and Jeff on whether or not the d30 rule is dissociated. Zak doesn’t use the words “associated” or “dissociated” anywhere, but it’s really the same issue from a different angle. Are players reasoning about cause and effect within the game world or within the structure of the rules? For a number of turns equal to the casters level +6 turns, the caster can move up and down as he wishes. The caster mentally directs movement up or down as much as 20 feet each round. The caster cannot move horizontally, but could clamber along the face of a cliff, for example, or push against a ceiling to move laterally (generally at half base land speed). Every enemy (but not ally) within a 15 foot radius is shifted two squares (10 feet) and become adjacent to you do so, and then you get to make a weapon vs. AC attack against them. In the first example, the meaning is primary. The caster is no longer subject to the limitations of gravity, and can move themselves around at some set speed. In the second example, the effect is primary. Enemies come to the PC to be hit. We don’t know why. Did the PC taunt the enemies? Did the PC lasso the enemies? Either might make sense in different cases, and many people don’t bother at all with narrative explanations. Obviously, it is not an either/or thing, but one of association or dissociation is usually dominant. In the first example, the duration in turns is somewhat dissociated (why would levitation only be available in game-convenient durations that are a multiple of ten minutes? ), but unobtrusively so. The common example of a limited martial resource (such as a daily power) as a dissociated mechanic is really just a special case of this more general “meaning first” or “effect first” principle. It is easier to make a balanced game using effect first design, which is why 4E leans so heavily on dissociated mechanics, as mathematical balance was an important goal for that system. The examples above also show how this issue is orthogonal to realism. Levitating is obviously not realistic (at least based on my experience), but it is associated. Enemies moving toward you and then you hitting them is realistic, but it is dissociated. Why are they moving toward you? Why do you as a player have the ability to affect the movement of your enemies? You can come up with an after the fact narrative explanation, but the meaning is secondary and the effect is primary. As has been noted in some of the links above, there are some dissociated mechanics in traditional D&D too. Hit points and experience points are notable. To elaborate, the effects of gaining a level are primary (more staying power, additional spell capability, followers, whatever), and the narrative explanation is after the fact. Was the PC training? Did a demon grant them extra power? We often don’t know. HP and damage are probably the most problematic. How can cure light wounds help with the loss of luck and fatigue? We can come up with an explanation, but it’s certainly not obvious. Weapon and armor restrictions are another common dissociated irritant that has prompted many house rules, my own included (see here for weapon damage by hit die and a system to do away with armor restrictions). The major difference, as I see it, in how new school games and old school games do things is that the dissociated mechanics of old school games affect encounter-based problem solving less than they do in new school games. And when they do affect problem solving (perhaps equipping every character in OD&D with daggers because they are cheaper and all weapons do 1d6 damage) that is considered pathological, and either fixed with house rules or condemned as against the spirit of the game. From the standpoint of creative problem solving, if meaning is first, the potential effects are limitless, and this is in my opinion why many people are uncomfortable with the extensive use of effect-first mechanics. Edit: I’m sure this post was influenced by On the Failure of Tactical Combat over at Hack & Slash (though his post focuses, unsurprisingly, more on combat). So go read that too. This entry was posted in Uncategorized and tagged D&D 4E on June 9, 2012 by Necropraxis. 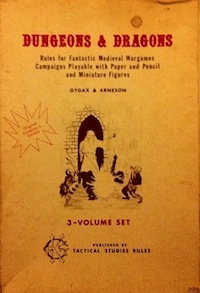 Wherein I comment on the discovery of OD&D by a 4E player and DDI contributor. It’s always interesting to see the reactions to OD&D from players of later editions. Here are some quotes interspersed with my comments. With five PCs (one charmed) and 10 Nixies, the result was a TPK. And yet, we were all laughing and having a blast. Remember that thing about DM control? The PCs came to underwater, in an air pocket in the Nixies’ lair. After some fun interaction they allowed the PCs not to serve them for one year, and instead they had to go to the Temple of the Frog and end the threat. Now, that might sound like he was being a pushover DM (there was, after all, a TPK), but I actually find myself enjoying the development. As a referee myself, I don’t like undoing PC death, but if I had decided beforehand that the nixies were just trying to subdue (even if before meant as I was rolling up the encounter at the table), I would have felt better about it. What a great lead-in to Temple of the Frog though: servants of nixies for a year. Ian of the Going Last podcast, largely held to be a cheese monkey, cast Charm on my hireling. He then told my hireling to kill himself. Checking the rules, they had not yet added the errata to stop this. Ok, I figured I would let this one happen. Now Ian asks about XP. Sure. They get 100 XP, plus 100XP more for his equipment (since in these editions you get XP for gold). Well played. I think this is pretty clearly against the spirit of the game, which gives XP for treasure recovered and danger faced. My feeling is that 4E creates these big set-piece combats that are often inside rooms and consume a big part of a play session. Because of that, we lose all the other bits (the exploration, the movement, the empty rooms we still search, etc. The dungeon ceases to feel extensive, mysterious, holistic, ecological. Those other bits end up being important to the experience. All damage was a d6, which led the players to have fun with unarmed attacks, throwing a crossbow bolt by hand, and other silly things that still do d6 damage on a hit. In general, combat was more descriptive. I have definitely noticed this in my 4E Nalfeshnee game. I think that is in part because many of the powers are just not very describable. Many seem out of place; a particularly egregious example being the bard power war song strike, which just becomes ridiculous ofter one or two uses (it is an at-will power). Also: perhaps player description has an inverse relationship with power description. In fact, I would argue that we can generalize this. Description and flavor are a fixed quantity. If the setting and rules supply more, the players (including the referee) will supply less. Here I strongly disagree. This area is suitable for any level as an obstacle. Remember those scenes in the original Star Wars on the Death Star with the battalions of storm troopers? Han et al sneaked around. Same thing. The idea that everything should be fought head-on and killed is one of the more pernicious RPG trends (actually, I blame video games more than 3E and 4E). This entry was posted in Uncategorized and tagged D&D 4E on January 18, 2012 by Necropraxis. I am currently running a house ruled Fourth Edition game. Following Zak, I have decided for ease of reference to call this internally the Nalfeshnee Hack. I started this game right when I got back into the hobby (in fact, one might say that this game was the reason I got back into the hobby, and online research for it is how I discovered the OSR). 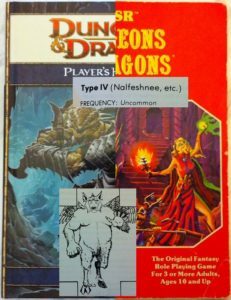 At the time I had very little conception of the differences between 4E and earlier systems; I just jumped in, becoming familiar with the system as we played. Now the game is established. We are 14 sessions in, I have 7 players (all coworkers), and we play in the company board room every Monday evening that a quorum is available. I’m going to stick with it even though in a perfect world I would probably choose something like B/X or LotFP. I have tended to choose the initiative system on a case by case basis. I originally tried using the official individual initiative system as specified in the 4E rulebooks, but I always end up feeling flustered in play when I use that. We’re slowly tending towards the B/X style of initiative as specified above. On the other hand, I do like the uncertainty involved in choosing an initiative system semi-arbitrarily. I don’t think any of my players have taken advantage of the option to select skills & languages during play (this is a slight variation on the LotFP language rules). They are too accustomed to doing full “character builds” before the game starts. I will probably encourage this more directly the next time someone creates a new character. The Fourth Edition PC death rules state that at 0 HP or fewer PCs are dying. At negative bloodied value (half of full HP), the character is dead. When in negative territory but not yet dead, a PC is unconscious and must make a “death saving throw” every turn (saves in Fourth Edition have very little relation to saving throws in previous editions; a save is a 55% success check unaffected by level, ability scores, or skills). Three “death saving throw” failures mean death, and a natural 20 on this check allows the PC to spend a healing surge and bounce back up. This system just seems clunky to me in play, and not dangerous enough. Hovering on Death’s Door (Second Edition Dungeon Master Guide page 75) has PCs unconscious at 0, dead at -10, and loosing 1 HP per round while in negative territory and not stabilized. Any cure spell restores the dying PC to consciousness at 1 HP. In general, my players have been good sports regarding my experimentation and divergence from the rules as written, and for that I am thankful. 8 January 2012 edit: added image. This entry was posted in Rules and tagged D&D 4E on December 11, 2011 by Necropraxis.